Nonviolence is usually understood by most as not-hurting or harming others or not eating meat. It is a very simplistic and rather superficial interpretation of nonviolence. Nonviolence in the spiritual sense means not having any kind of violence or disturbance in the mind. It means not disturbing oneself or others in any form. A non-violent mind is at peace with itself and with others. It does not disturb others. It does not react to external phenomena, however distasteful they may be, because it learns to accept and tolerate the vagaries of the world as part of its spiritual training. This is the state of yoga, adepts achieve at the end of a very prolonged spiritual practice and inner transformation. Modifications in any form mean violence and violence is the way of the Nature, while peace or absence of modifications is the way of the yogis who have conquered their nature and learned to stabilize their minds in the contemplation of their inner Selves (Isvara). Nonviolence is considered the highest virtue or the virtue of virtues because all virtues said to lead to this state only. You become non-violent only when you end your desires and attain perfection or fullness in all respects. In that state you will neither oppress nor suppress anything or anyone for your gain. You will not hurt or harm others, not even think of it. You cease to disturb others as you become fully detached from the world and remain indifferent to all that happens around you. Thus we can say that sameness, equanimity, detachment, indifference, humility, surrender, compassion and love arise from the state of nonviolence only. Since nonviolence is so central to liberation and inner purification, it is the first of the five restraints recommended by the classical yoga to achieve peace and stability. The idea of nonviolence is also well reflected in the following verse from the Bhagavadgita., which declares that God loves those who do not disturb others. Now you will not disturb others under two conditions: when you are fully asleep or when you are fully awake. The former is a state of self-absorption and the latter a state of wisdom and enlightenment. From this perspective, the nonviolence practiced in politics is not the same as the nonviolence practiced by the yogis in spiritual life because it aims to achieve political ends by changing and disturbing the status quo. Through nonviolence Gandhi upset the British rule and in the process also stirred the whole nation into national fervor, a mental modification (citta-vritti) that does not truly reflect a non-violent state. Gandhi tried the impossible by introducing nonviolence as a political weapon to be practiced by people who were basically materialistic and not trained to be non-violent like the yogis. 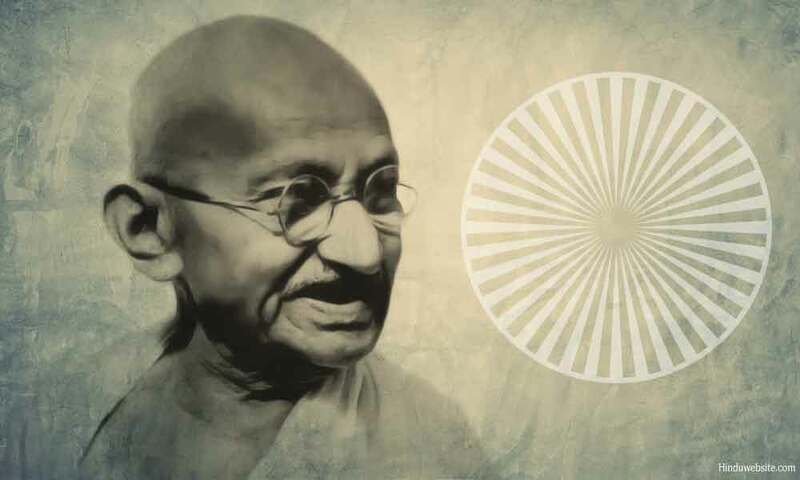 He practiced nonviolence to free India from the British rule, not for the liberation of the mind but for the liberation of a country from oppression and exploitation. In the process he stirred the whole nation into a state of non-cooperation and passive resistance. From spiritual perspective, these two were far from the highest virtues of dispassion, surrender and detachment envisioned in the yoga. Sadly, Gandhi used a very ancient Indian virtue rather shrewdly for his political ends with the help of people who were not ready for it and in the process could not help violating its very purpose, which is to achieve peace and stability. In the end his methods brought freedom to the country but at a great cost. The country that eventually emerged out of his effort was a complete negation of his values and beliefs. It is a country ravaged by wars, communal clashes, political instability, poverty, economic disparities, violence and corruption. And Gandhi himself met with a violent end. The modern India that emerged after independence has never come to terms with nonviolence except on paper, and once in a while on days like October 2, Gandhi's birth anniversary when the leaders of that country pay lip service to him with bright and cheerful words and then return to their violent ways to pursue their selfish ends.